On February 14 of this year, at Stoneman Douglas High School, located in Parkland, Florida, a mass school shooting occurred. The perpetrator, Nikolas Cruz, ex-student, killed seventeen students and staff from the age range of 14 to 49. Seventeen more were wounded. In response to this act, staff, families, and the community started the advocacy group, Never Again MSD, led by the students and victims themselves. Due to the tragedy these students experienced, they now call for stricter gun control in the United States, and follow up this movement with hashtags such as #NeverAgain, and #Enough. Students in Washington DC and the surrounding areas marched to both the White House and Capitol Hill. On the capitol lawn, 7,000 pairs of children’s shoes were laid down in tribute to every American student killed due to gun violence in the last 6 years. In lower Manhattan, New York Governor, Andrew Cuomo was found lying in the street with a multitude of others, calling it a ‘die-in’. Many protesters collected at the Trump International Hotel and Tower to express their thoughts on gun control towards a business owned by the President himself. At Stoneman Douglas High, students gathered at the football field. 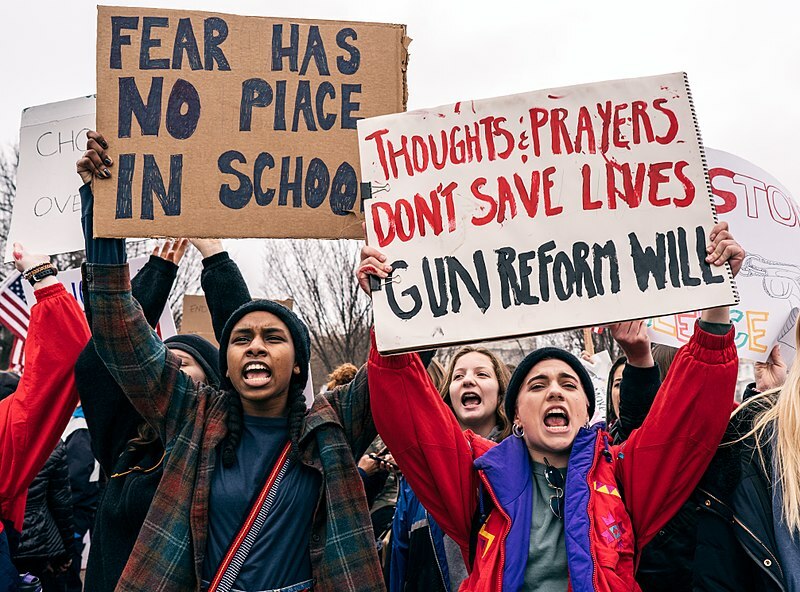 These nationwide school walkouts also inspired many from past school shootings, such as Colorado’s Columbine High School, to speak on and walk out to what they believe the government should take action on. Even Upper Merion itself, both middle school and high school, participated in the nationwide school walkout. Students gathered around the football field and track, standing in silence for those 17 minutes. Amanda Haak, a junior, was spirited on the subject when interviewed. She noted, “[Before,] the rest remained bystanders … The walkout for me was a way of saying, ‘These grievances will not be forgotten’”. Jack Briggs, a sophomore, was another one of the students who lead the walkout. He told the Viking Call, “It was nice to see how our school can stand up along with the Middle School … we felt we had to do something more than just ‘thoughts and prayers’”. While there are indeed many different views on the school walkouts and the theme of the Stoneman Douglas mass school shooting, the same organizations are planning another large nationwide walkout for tribute on the anniversary of the Columbine shooting.